I am in love with this mani! 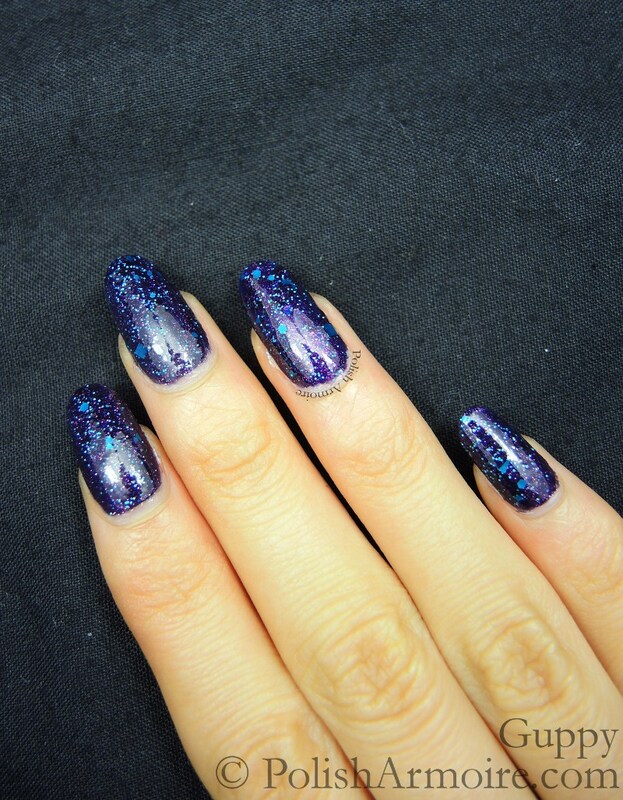 The blue glitter in Glitter Bunny Don’t Be A Guppy really pops against the deep plum base. The purple shimmer in the background is also a gorgeous accompanient to the blue glitter. My camera wasn’t able to fully capture the holo-ness of the small glitter in Don’t Be A Guppy but it’s there! Milani Totally Cool is opaque in 5-6 coats by itself so I recommend layering it over a matching dark purple base. I have one dabbed coat of Don’t Be Such A Guppy on all the nails and 3-4 coats of Nubar Purple Glitter Rain on all my nails except for the ring finger. I wish I had used Milani Totally Cool on all the nails instead of just the ring finger because it is much more shimmery than the Nubar! Tags: blue, Glitter. Bookmark the permalink. I liked the way you reviewed THAT POLISH !!! surely “DONT BE SUCH A GUPPY” is gonna be in my wish list . Hi darling, I’m tagging you. There’s a getting to know me tag going around and I’d love to read your answers.